Get ready to experience a clown themed experience like no other through this 3-reeeld classic slot machine that is developed by none other than Microgaming. The game is themed around a clown called Jester, and this clown wants nothing more than to give you his jackpot payout, this is why the game is entitled Jester’s Jackpot. The game has the classic setup of traditional slot machines as it has 3 reels and in the middle of these three reels, players will find one single payline that they will have to get winning combos on so they can get paid. 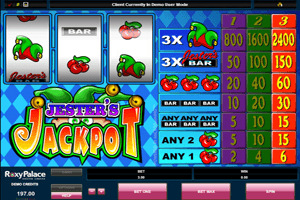 Play Jesters Jackpot Slot here. Players can place their wanted bets under the reels by choosing the value of the coin and whether they want to place 1, 2 or 3 coins on each spin. Placing 3 coins is recommended because it gives players the chance to trigger the jackpot of the slot machine which is equal 2400 coins. This payout is given to players who succeed in landing three Jester’s hat symbols on the payline of the game. If they place 1 or 2 coins, they will earn 800 and 1600 respectively. Other symbols that also give great payouts that spin on the reels are the bar symbols and red cherry symbols. Players will be able to check out all of the available payouts at the game’s paytable which is found on the right side of the reels.